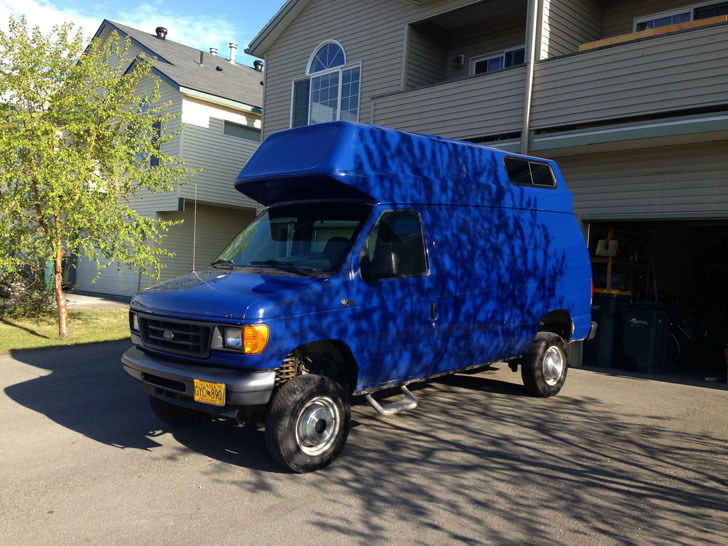 Wanting to save money, this Alaskan converted a Sears van into a camper with extra headroom. 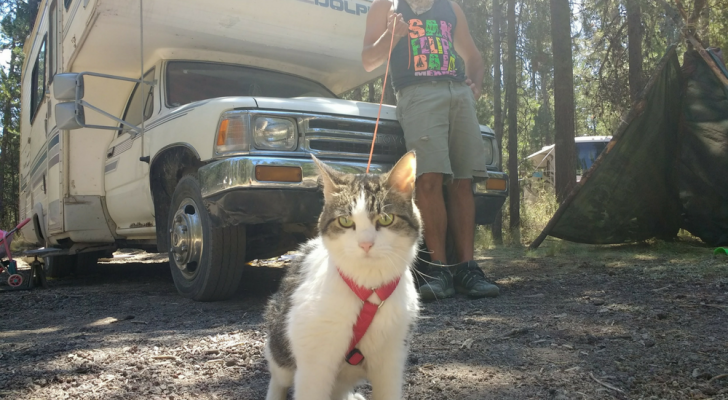 Some RVs can be out of reach for many would-be weekend warriors. 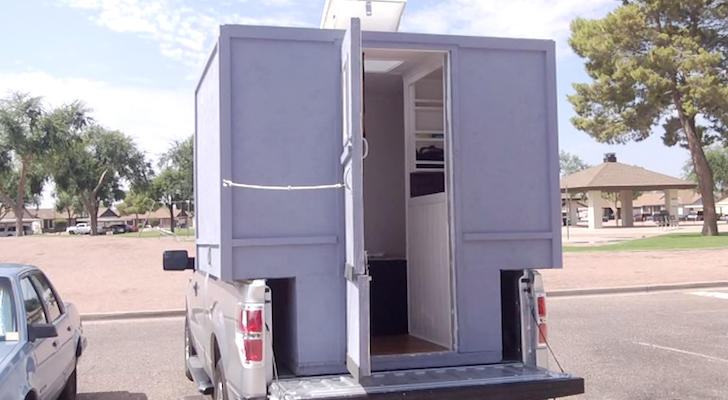 There is more than one way to achieve the dream of having a home on wheels, and not all of them cost as much as you might think. Imgur user Savagepooh shared a transformation story that we found inspiring! A native Alaskan, Savage wanted a camper that was up to the wilds of his home state. 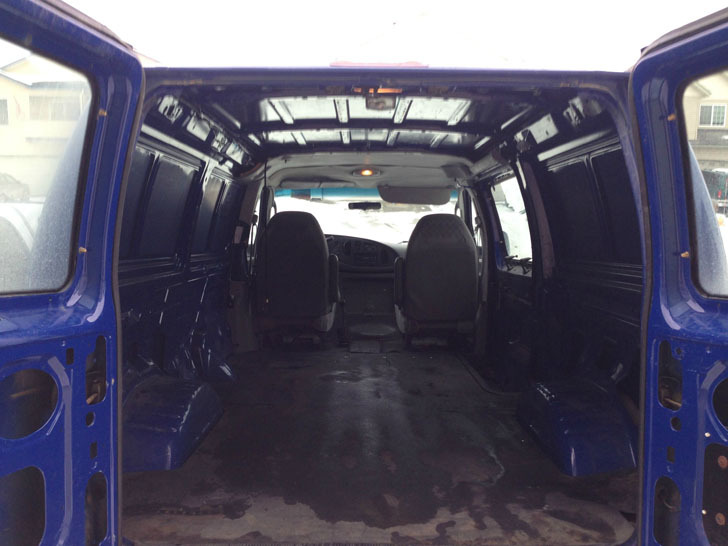 Former Sears service van, soon to be RV shell. 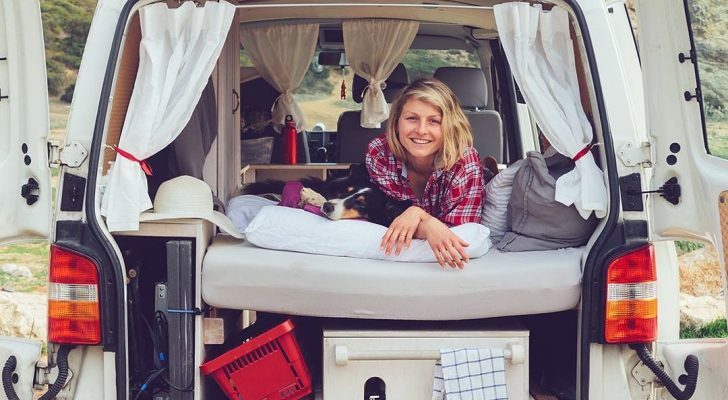 Rather than spending a small fortune on a used RV that would probably have required work to be road worthy (that’s the trade off with getting a good deal!) Savage decided to build his own camper. 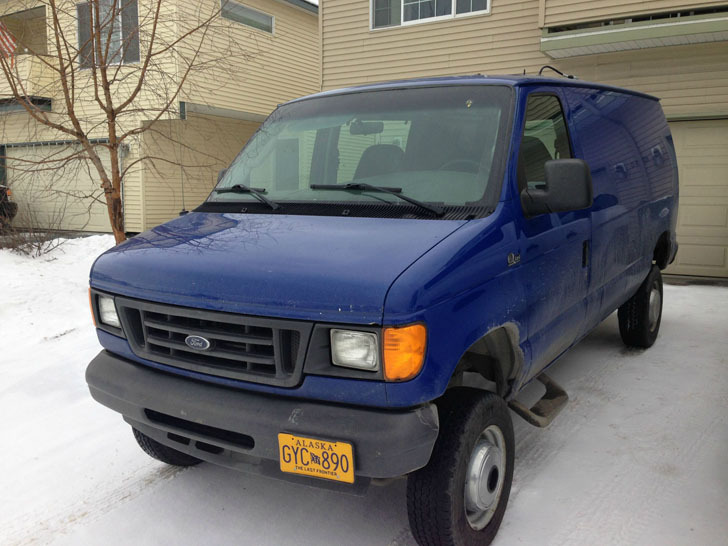 The base vehicle may surprise you: a fairly standard Ford service truck van that used to belong to Sears. 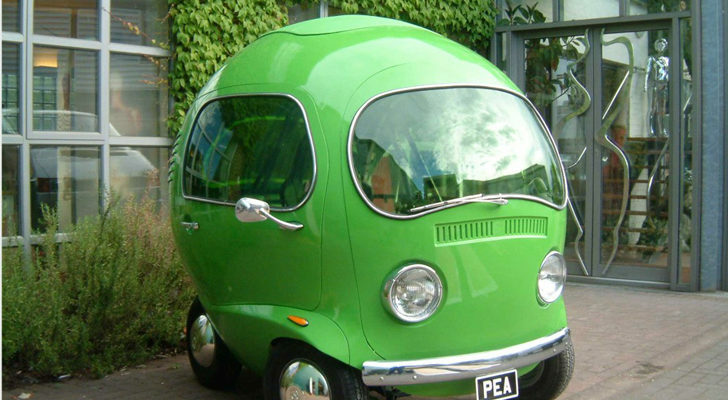 It was easier than you might think to add a camper top. 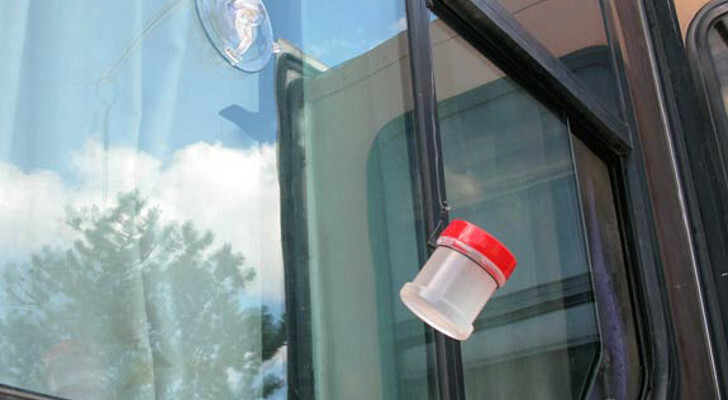 In fact, in a good, hard weekend’s work, the average handyman could go from truck to RV shell. 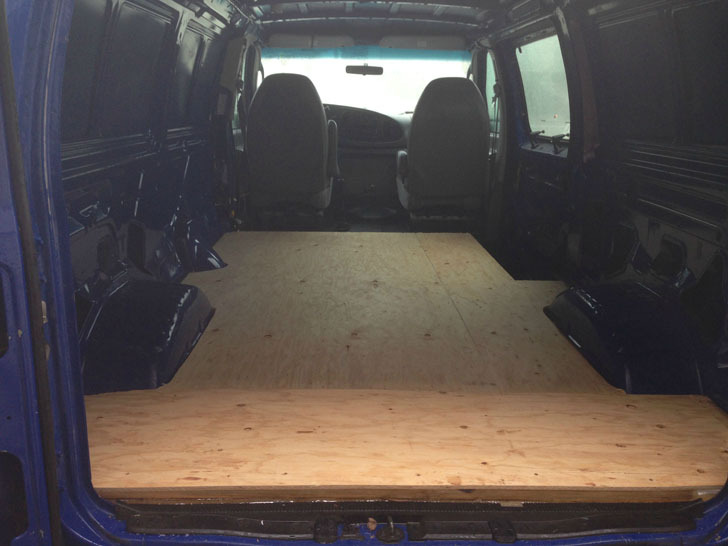 An empty cargo van provides the best blank canvas. 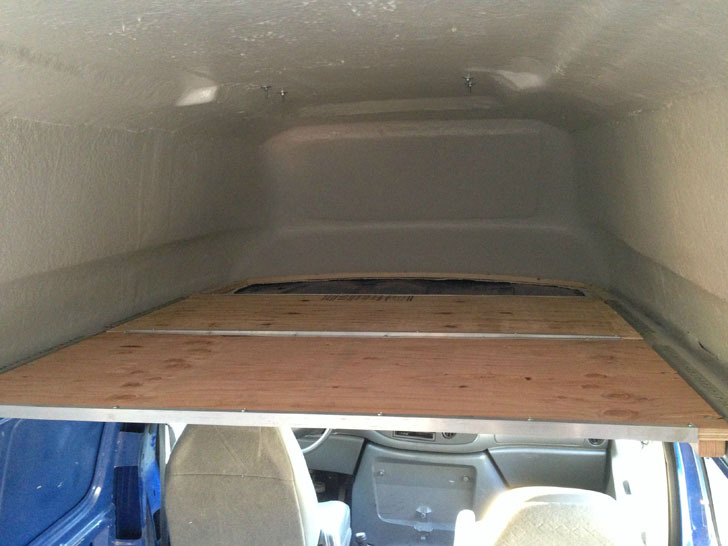 In this story, the van was an empty cargo shell. 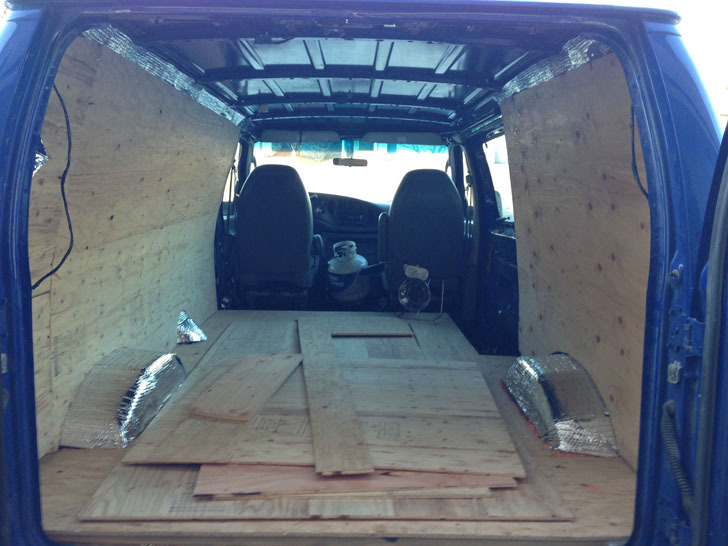 This is probably the cheapest and easiest way to begin, but any standard van would work. This one happens to be a 4×4, because it’s Alaska, after all. Radiant barrier with insulation and plywood on top. Savage started the renovation with the floor. 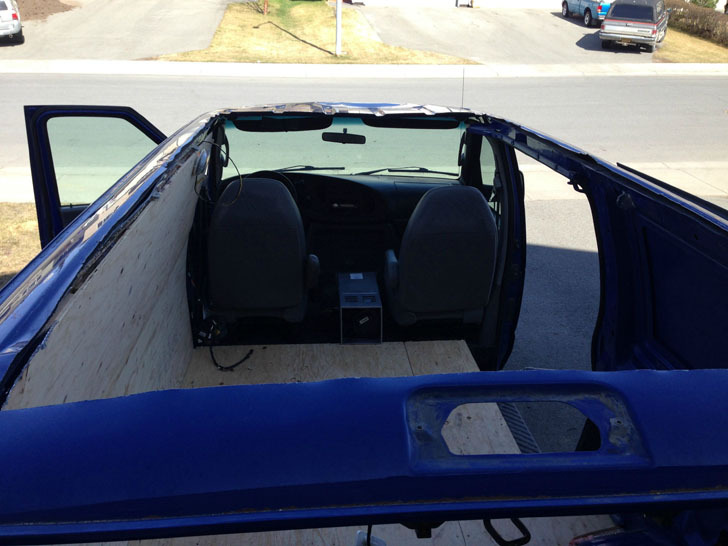 Adding insulation and a plywood floor will reduce road noise and make the finished camper easier to keep cool or warm. Two by twos served as the foundation. 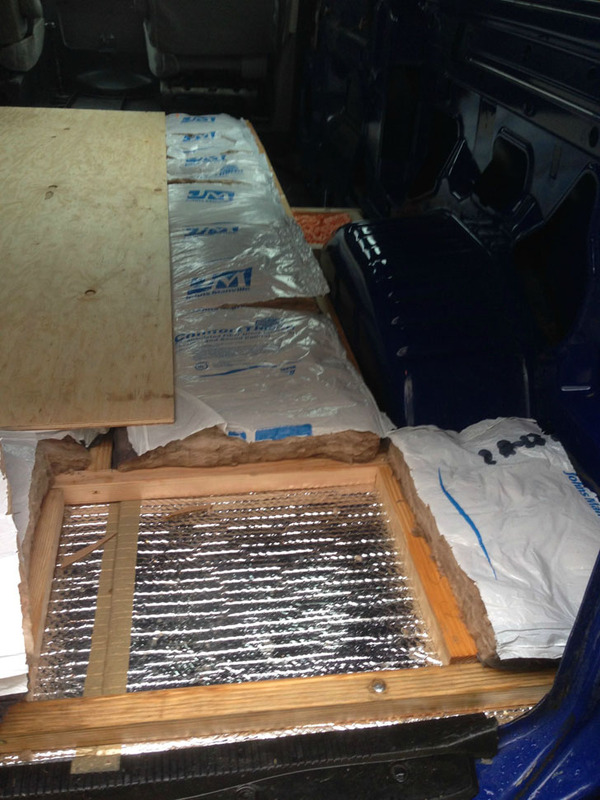 They provide enough room for the insulation and are easy to fasten the plywood to. Smaller lumber would not accept screws long enough to make a tight joint. The initial wall system frame. 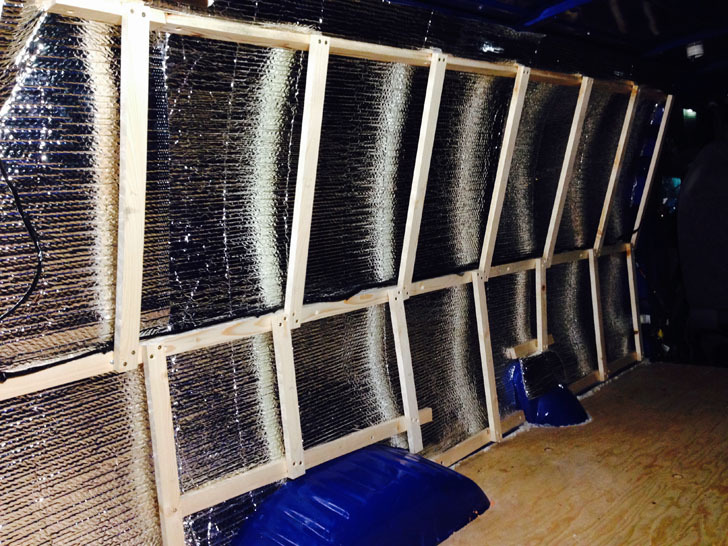 Next the walls were lined with an R-13 Reflectix foil insulation barrier and a wood frame was installed. Savagepooh eventually scrapped this wall system, but I am including it here because I think it could work, if the camper top were installed first. First attempt at wall paneling. The finished walls were lined with plywood. Cutting out the roof is surprisingly easy. The top was then cut away using what looks like a cordless DeWalt reciprocating saw, commonly known as a Sawzall. Almost any reciprocating saw with a blade designed for cutting heavy gauge sheet metal could make the cut. 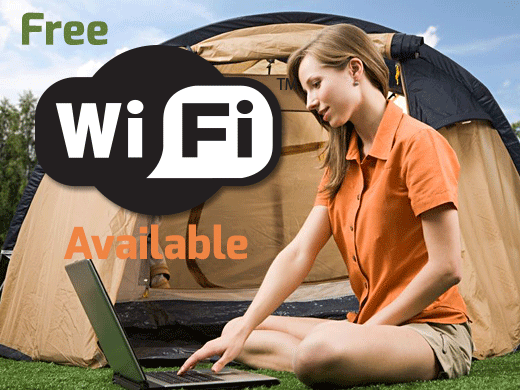 Measure carefully and mark a clear line before attempting this, you only get one shot! Here’s a top view of the new converted roof! The top was custom ordered from a company called Fiberine. 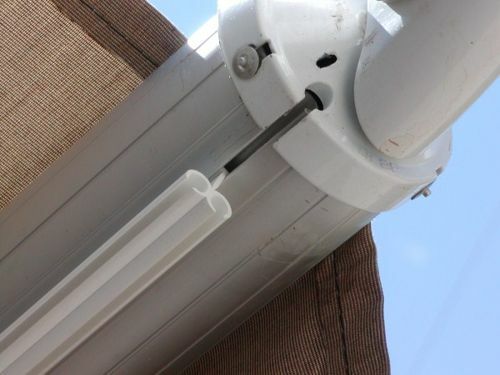 Due to the remote location, it took almost six weeks for delivery, and the total cost was around $5,500, considerably more than most would pay in the lower 48 states. 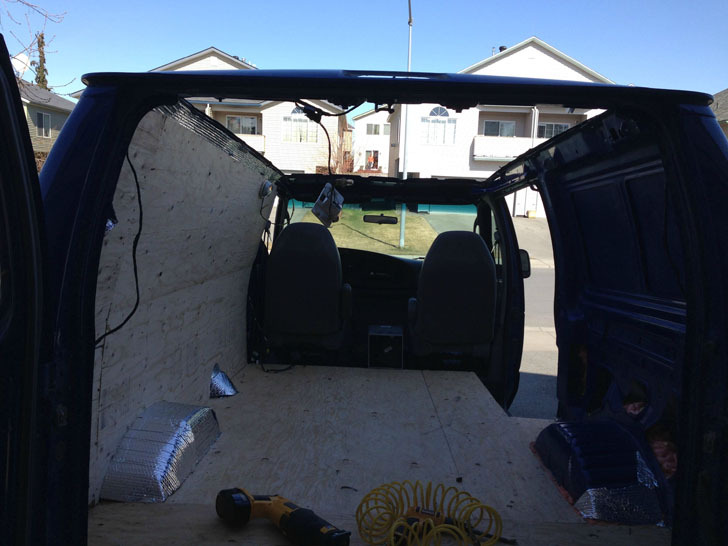 Here’s the camper top ready for install. 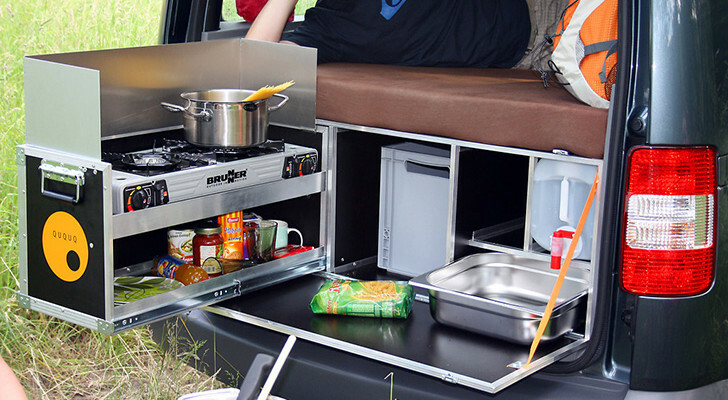 This top is the 30 inch Super Camper model, specifically made for the Ford standard length body. It fits perfectly. The topper weighs several hundred pounds, so have plenty of help or a forklift on hand when installing. You’ll need plenty of help, or a lift to get your top on. 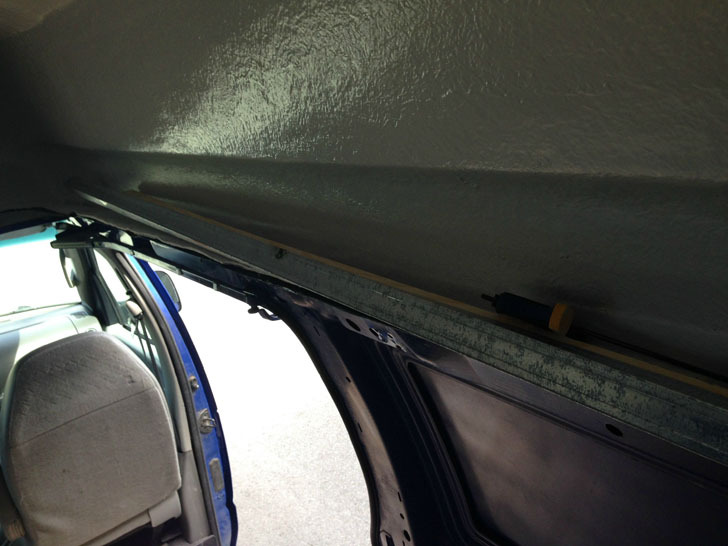 Once the top is in place, it is simply a matter of bolting it onto the van. Savage Pooh added a 1 by 2 strip on the top side of the topper lip to cushion the bolts a little, then covered the entire edge with metal edging for a smooth finish. Lot’s of room in the loft even with the sleeping platform in place. A simple bed platform made from ¾ inch plywood with aluminum edges for rigidity is the simplest way to add an upper bunk. 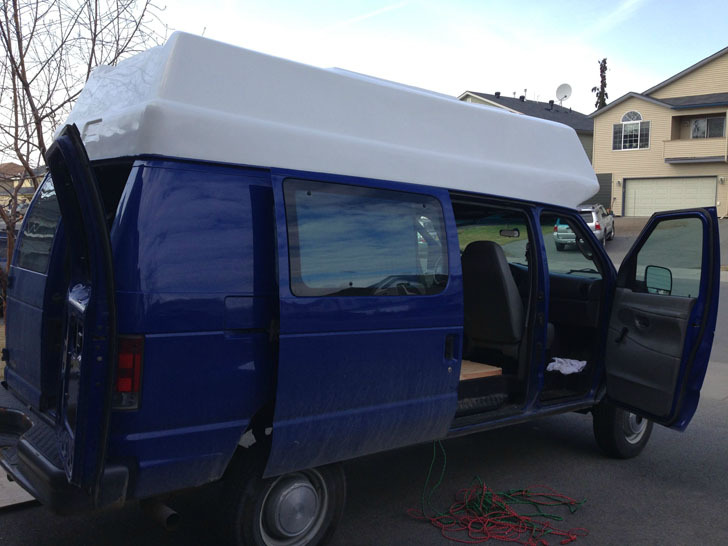 The panels can then have foam and fabric attached to create a sectional mattress that can be stacked in the nose of the topper when not in use. Save that extra headroom below! 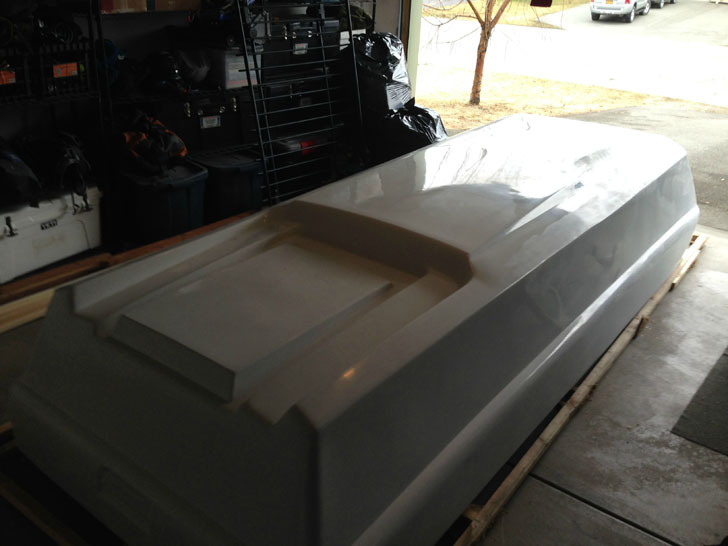 Finished RV shell with top painted to match.